What would you prefer; frozen food or locally sourced produce? Locally-sourced food is never a bad idea for both the customers and the people working within a restaurant. Knowing that the food you’re eating is fresh and made with care makes all the difference. The farm-to-table movement indicates a personal and first-hand exchange between a market and a commercial establishment. Instead of purchasing through a distributor or a food service, some restaurants establish connections with farmers markets and purchase their goods straight from them. Doing this is not only convenient for restaurant owners, but for farmers as well; they benefit by being able to gain more of the profit so their goods can earn at market. Here are some reasons why restaurants should shift over to the farm to table movement. Food additives, such as preservatives, flavorings, colors and other ingredients, truly take away the nutrition and authentic-ness of your food. By eliminating these artificial additives, you’re food will not only taste better, but look better as well. As a restaurant owner, you want to be apparent to the foods that come out of the kitchen and onto your customers’ plates. How does this movement help the environment? Two words; travel time. Not only does food travelling in transit take longer to arrive, but the produce takes in a lot of fuel. It also enough time for dirt and other bacteria to find its way on the food. Giving the diesel-filled transport trucks a break would do wonders for the environment and reduces the carbon footprint. Having your produce close at hand saves you tons of time for both browsing and transporting. This also helps keeps you in touch with the local seasons. This means you will be getting products when they are at their peak, are most abundant, and the least expensive. Any restaurant can benefit from these small changes. Here’s how to actually jump into this reliable movement. Get in contact with your local farmers markets and see if they are willing to sell their crops, animals and processes. 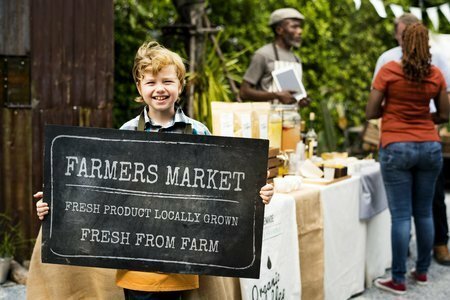 Visiting your local farmers market is the best way to begin relationships with farmers and become familiar with their produce, meat and grains. Your customers will appreciate you switching to this movement. Stay on top of your switch by updating your social media pages. Let Zanduco help you spread the word of your locally-sourced food with our signs, easels, and window and door signs.